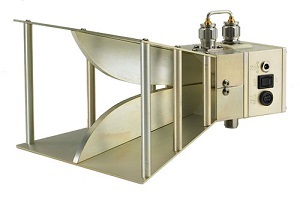 The model AHA-118 Active Horn Antenna is basically the AH-118 Horn Antenna with an integrated preamplifier. The preamplifier has a nominal gain of 20 dB for the entire frequency range. The preamplifier improves the effective system noise performance for emissions testing as explained below. The antenna AH-118 is linearly polarized and has a frequency range of 1-18 GHz. The output of the antenna is connected to the preamplifier by a short low loss cable, which can be removed. This arrangement makes it possible to (1) insert a filter before the amplifier and (2) use the antenna alone for transmission. The filter insertion capability is important and is required in presence of a high-level signal (such as fundamental frequency), which possibly could saturate the amplifier if the filter is not used. The transmitted signal flow is in opposite direction and uses a higher power level. Both conditions could damage the preamplifier if not removed. This antenna is constructed using lightweight aluminum with a corrosion resistant conductive coating. The rear mounting plate of the AHA-118 has 1/4 inch x 20 threads. These threads allow the antenna to be mounted on a model AT-100 antenna tripod or any tripod with similar mounting arrangement. The antenna is powered by an supplied external DC wall mount adapter.